Hiya guys! Woohoo, it's mid-week and we are that much closer to the weekend. Even on weekends when I don't have plans I find myself counting down. I think it's mostly just the fact that I can sleep in with my puppy. Because let's face it, I love to sleep! When now when I am finally getting better health wise I still need like twelve hours of sleep daily, haha. Best feeling ever. But anyway, I've been super pumped to share these polishes from that I received from the Russian stockist Polish Molish! 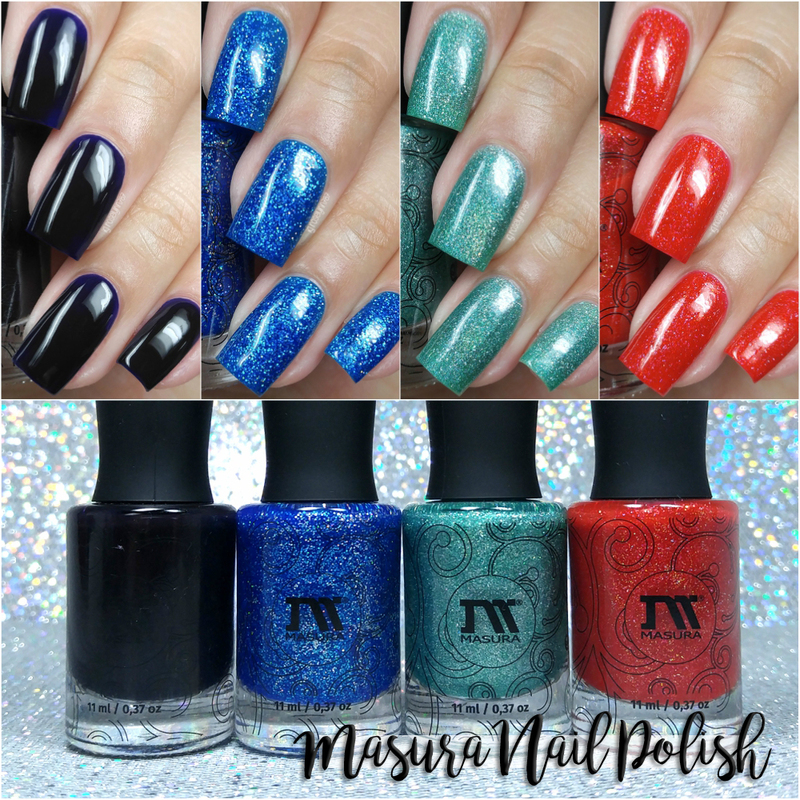 I was allowed to pick a few shades from the Russian brand Masura Nail Polish, so I aimed for a variety of hues and finishes. Without further ado, let's get started! Masura Nail Polish can be purchased internationally through the stocklist Polish Molish. Each full-size 11mL bottle retails for approximately $5.75 USD depending on the finish. Amsterdam can be described as a bright blue holographic micro-glitter jelly. Starting off this review with one of my favorite shades from this brand thus far. From the second I saw the bottle I knew it was going to be perfection and it didn't let me down. Photos don't do the holo sparkle any justice, it truly comes to life under direct sunlight. The formula has a sheer jelly-like application. It builds-up nice and even for full coverage. The consistency is well balanced, not too thick or too thin. It does dry down on the gritty side, but smooths out well after a thick layer of topcoat. Also I'm also happy to report I experienced no staining on removal to my nail beds or cuticles. Shown in three coats and sealed with a glossy topcoat. 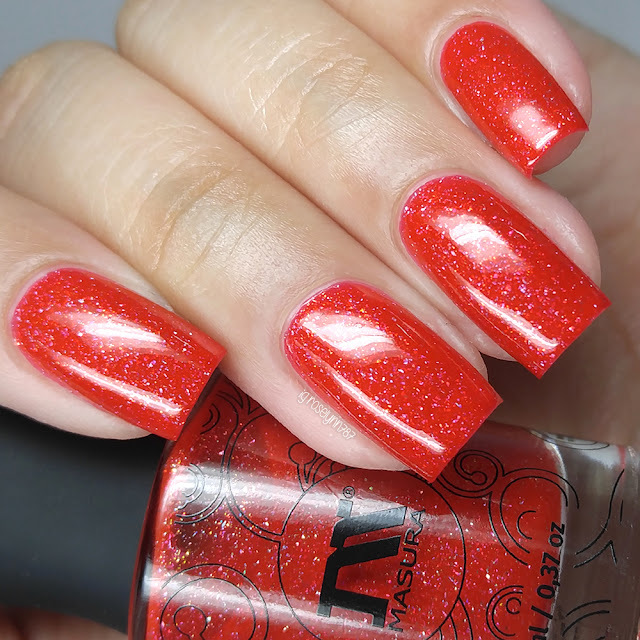 Scarlet Sails can be described as a berry red micro-shimmer with golden glitters. Of course I had to pick out a red shade as well. Reds are always a favorite of mine especially ones like this... full of shimmer and glitters! 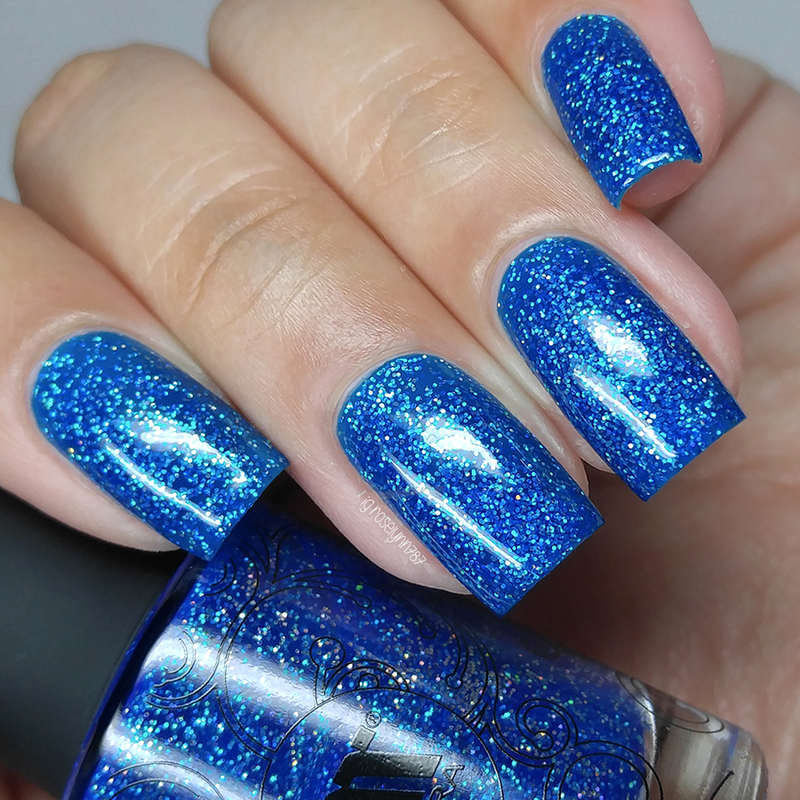 The shimmer ends up giving this polish such a nice touch for that depth pop factor. The formula has a really opaque application, but not quite enough to be a one coater. Plus the second coat helps add a lot more shimmer and sparkle. The consistency is nice and balanced making it very easy to work with. I had no staining on removal on my nail beds or cuticles. Shown in two coats and sealed with a glossy topcoat. For Him can be described as a inky jelly with violet undertones. This one actually ended up being a favorite of my husband funny enough. I liked it as well, but did feel the dark undertones overshadowed the purple. That said, this one is definitely a unique and beautiful color. The formula has a sheer application as expected from a jelly-finish, but it is on the patchy side as well. Consistency wise it leans on the thin side, but is manageable and layers with ease. I did experience some minor staining on removal on my nail and it left behind a slight tint. Shown in three coats and sealed with a glossy topcoat. Mint Breeze can be described as a mint holographic. Rounding out the review with another favorite of mine. The formula has a sheer application, almost like a jelly polish. It has great even build-up for full coverage. Consistency wise it's very balanced, not too thick or too thin. It dries down to a minimal gritty finish and smooths out nicely after topcoat. Shown in three coats and sealed with a glossy topcoat. To recap, Masura Nail Polish can be purchased internationally through the stocklist Polish Molish. Each full-size 11mL bottle retails for approximately $5.75 USD depending on the finish.